The EU ambassador to Macedonia talks to BIRN about the challenges to the EU’s values, its future – and about Macedonia’s welcome return to the path of reform. It has been an uphill battle for the EU in recent years. From the economic crisis in Greece to Britain’s announced exit, the migration crisis, and then to Hungary’s and Poland’s backsliding from basic democratic values, the EU has faced one challenge after another. The rise of populism, xenophobia and hate speech, the epidemic of fake news, and the increased attempts to shut down independent media and assert control over judiciary and state institutions have shaken the foundations of the European Union, and even brought its future into question. There are all serious challenges, but the EU’s values must remain the same, the EU ambassador to Macedonia, Samuel Zbogar, told BIRN in an interview. “We had so many challenges in the past including the rise of nationalism in some member states, some departures from European values of some member states themselves, so that has brought about a realization in the union of the need to stop and reflect,” he said. Europe now needs to recalibrate, if it is to remains the best vehicle for providing peace, security and prosperity in Europe, as it did in the past six decades. 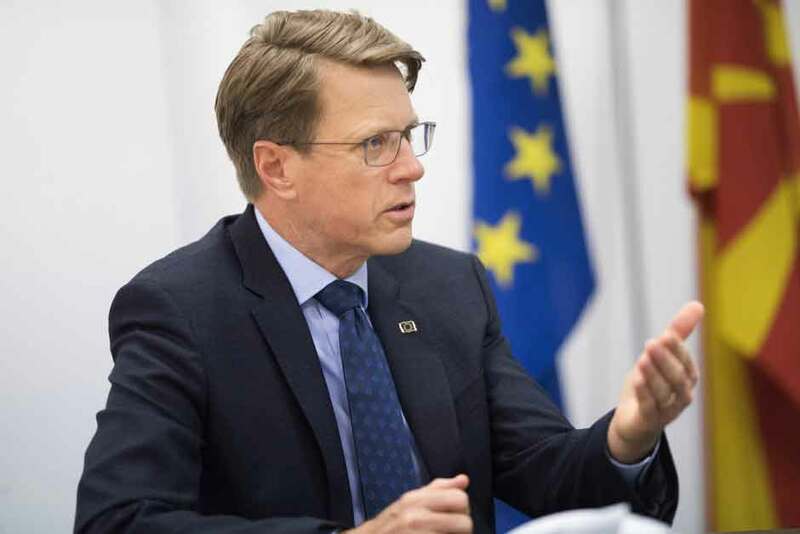 “Last year, the commission came forward with the white paper on the future of Europe, with the five scenarios on how the European Union should look in the future,” he recalled. “Should it be the same, should it be more integrated, should it be less integrated, should it allow the group of countries who want to move on to move on? This is now the phase we are in,” he explained. In Poland, government efforts to undermine judicial independence have gone so far that the EU has deployed Article 7, known as “the nuclear option,” a move that could potentially strip Poland of its voting rights and EU funds. However, this radical move requires the support of all member states – and Hungary, for one, has made it clear that it supports Poland. At the same time, following his sweeping victory in elections, Hungary’s leader, Viktor Orban has a new mandate to proceed with law changes imposing a 25-per-cent tax on NGOs that support immigration. Orban’s campaign concentrated heavily on the Hungarian-born billionaire philanthropist George Soros, accusing him of political interference in Hungary’s affairs, and of attempting to foist unwanted migrants on it. In response, and in an attempt to curb behaviour that is deemed a threat to the core values of the EU, and show others that authoritarianism will not go unpunished, last week the Commission proposed a separate measure to block EU funds, if a country has manifest issues with the rule of law or problems with financial management.